The Devil gets furious with those striving for their own spiritual perfection and so everyday he engages in a fight with them, tempting them towards evil; if he doesn’t manage today, he hopes to do so tomorrow; he knows the weaknesses of everyone and also how to exploit them, by driving people to impurity, hate or the abuse of God’s mercy. 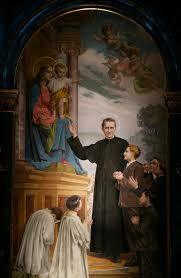 The Demon often took a monstrous, visible form and personally attacked Don Bosco. Such phenomena was repeated with so much insistence that the Saint’s health suffered greatly. One night, the priest, Angelo Savio, decided courageously to keep vigil in the Saint’s hallway, to validate the strange phenomena; but upon hearing the diabolical rumblings, he was seized with fright and so filled with terror that he fled back to his own room. Despite all the battles with the Demon, the Saint managed to realize God’s plans and triumphed completely over his enemy with the aid of Our Lady Help of Christians.